Buffered is a little on the pricey side for individual users, but a family or small office could find it a good value. Buffered VPN was founded in Budapest in 2013 and finally launched the 1.0 version of its app in March 2016. Yet another VPN service claiming to be the fastest and most secure of them all, Buffered says its mission is to make the internet a less restricted place. Unless you’re a member of the press, Buffered doesn’t offer a free trial. Users can avail of a 30-day money-back guarantee, with a few caveats: you must use Buffered under 100 times, consume less than 10 GB of bandwidth, and be connected fewer than 10 hours. Buffered only has a single subscription tier, but prices vary depending on how long you’re willing to commit. A single month costs $12.99 (GBP 10.03). A six-month plan knocks the price down to $9.99 (GBP 7.72) per month, and a full year to $8.25 (GBP 6.37) per month. That’s squarely in the upper price bracket as far as VPNs go, right up there with ExpressVPN. A subscription nets you unlimited bandwidth and up to five simultaneous connections, making it a better deal for a family, group of friends, or small office than individual users. Buffered only supports the OpenVPN protocol, whether you use its app or not. OpenVPN is widely regarded as the most trusted and secure VPN protocol for consumers, but it doesn’t come with built-in support on most operating systems like PPTP or L2TP/IPSec. Buffered supports both UDP and TCP connections, but defaults to UDP. We’d be fine with an OpenVPN-only service, except that Buffered doesn’t make any mobile apps–not for Android, iOS, or any other mobile platform. Because customers can’t just set up an L2TP/IPSec connection using the built-in VPN settings on their phone, they must download a third-party OpenVPN app like OpenVPN Connect. Because config files for Buffered aren’t included with these apps, mobile users must download and import them from the Buffered website. Desktop clients are available for Windows and Mac OSX. A legacy Linux version (v0.6) is still in beta. Does Buffered VPN work with Netflix? Yes, we were able to stream the US catalog of Netflix shows when connected to a Buffered server in the United States. Buffered VPN bypassed the Netflix proxy error with no issues. In fact Buffered are so confident they even have a dedicated Netflix page. Once an account is activated via email confirmation, the user just needs to download and install the client, then input their username and password. Buffered’s desktop app features a lovely, smooth interface. The simple layout features a list of servers and their ping times, although the ping times, which indicate latency, never worked when we tested it. Servers can be pinned to the top by starring them. In the options menu, be sure to toggle on the “store login information” setting so you don’t have to re-enter your credentials every time you open the app. You can also set it to automatically log in and connect. Once connected, the app displays a connection summary including time connected, ping (didn’t work), download and upload speeds, total data download and uploaded in the current session, and assigned IP address. 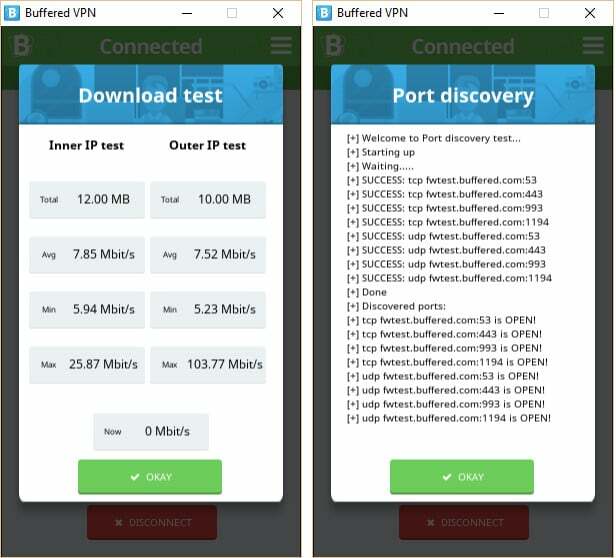 A download test lets you check both the download speed between your computer and the VPN server (inner IP), and the speed between the VPN server and the destination (outer IP). Additionally, a firewall test allows the user to see which UDP and TCP ports are open, which is useful if you need to port forward the connection. 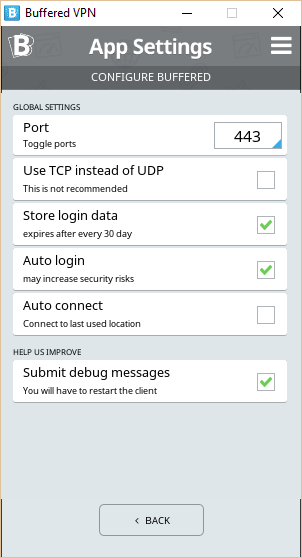 Users can select from a range of ports in the connection options before connecting. Aside from the ping data always turning up as “N/A”, the Buffered app is a simple, intuitive, and responsive client that novice users should have no problem figuring out. Buffered operates servers in 31 countries, with two locations each in the United States and United Kingdom. That’s a middle-of-the-road selection, but perhaps a bit narrow considering the price point. We streamed 1080p HD video without any issues. The video loaded far past the buffer. We were able to play Brawlhalla, a Super Smash Bros-style online fighting game, without any noticeable lag. Connections were stable once up and running, but we occasionally encountered issues initiating connections. Changing the port from the default 443 seemed to solve this problem. To test the speed more empirically, we downloaded the same 82.7MB file (compressed from 103MB) three times from three different servers at three different times per day for a total of nine tests. We did the same without a VPN as a control group. We included the test results for TigerVPN, another VPN we happened to be testing at the time, for comparison’s sake. We tested a US East coast server, US West coast server, and a London server. In the boxplot below, the thick black line represents the median download time, while the red diamond represents the mean. Lower is better. Buffered performed well enough but didn’t blow us away. Results were fairly consistent with no major outliers. While the median download time was higher than TigerVPN, the mean average download time scored significantly better. Keep in mind that this test is not a definitive indicator of which VPN is fastest. The internet’s inherent volatility adds a significant factor of randomness, so VPN speed tests should always be taken with a big grain of salt. Our tester’s location is in Buenos Aires, Argentina, where these tests are run on a 10 Mbps connection. Those with faster connections may well notice a larger discrepancy in speeds. Connections to Buffered servers are encrypted with a 128-bit AES SSL algorithm. That’s not as bulletproof as the 256-bit encryption used by some rivals, but it should be more than sufficient to keep the NSA, your ISP, and hackers out. Less encryption also results in a slightly faster connection. Buffered only uses dynamic shared IPs, which periodically change and are each used by many users at once. This adds a significant layer of anonymity but might be an inconvenience when visiting websites that log the IP of users (e.g. online banking). Buffered app users will use the company’s DNS servers instead of their ISP’s, which ensures more privacy. A quick test on IPleak.net showed the DNS leak protection works well. Buffered’s app does not come with a kill switch or network lock, so if the VPN connection drops, traffic will continue to travel through the default ISP. That can spell bad news for torrenters and the like who don’t want their ISP or anyone else to catch wind of their activity. Buffered states, “we never log” on its website, but what it really means is that it doesn’t keep usage logs. It does log some session metadata, including the user’s IP address, time connected, and connection duration. These logs don’t contain any of the content or activity of the user’s VPN traffic, but a true zero logs policy would still be preferable. Connection logs are also stored on the local machine, which tech support might ask for to help troubleshoot problems, but these are not stored on Buffered’s servers. Instead, they are saved in a hidden file in the local user directory, and can be accessed from the app. Buffered is headquartered in Hungary, which is a member of the European Union and inside the Schengen zone. The website does collect the usual data like IP, user agent, and stores billing info. Users can enter their address and phone number, but it’s entirely voluntary and can be faked. Buffered relies solely on a ticket submission system for customer support. You won’t find live chat or a phone number here. Two tickets we submitted each took about half a day to get a response–not exactly a fast turnaround. No hours are listed, but we suspect customer support only keeps to Hungarian office hours. The responses were competent and to the point. Update: Buffered says it now has round-the-clock support staff and has cut response time down to four hours. Still no live support, though. The website hosts a wide range of FAQs and support articles, including manual setup instructions for any devices that don’t have an app yet. They aren’t searchable on the site, though, so you might have an easier time finding what you want by typing it into Google. We didn’t receive any unsolicited emails or other communication during our time with Buffered. Buffered is a solid VPN service with a friendly app making it a good choice for novice users. Speeds are acceptable, security is sufficient, and it allows a lot of simultaneous connections, but nothing really screams “wow”. On the downside, some logs are kept, customer service is slow, and there’s no mobile apps. What you end up with doesn’t really warrant the high price point unless you get some friends or coworkers to pitch in.